The Barbizon school of painters is named after the village of Barbizon near Fontainebleau Forest, France, where these artists gathered (1830 – 1870). The Barbizon painters themselves were part of a movement towards realism in art, which arose in the context of the dominant Romantic Movement of the time. In 1824 the Salon de Paris exhibited a number of paintings by John Constable depicting scenes of rural life. During the Revolutions of 1848 artists gathered at Barbizon to follow Constable’s ideas, making nature the subject of their paintings. Constable’s works influenced some of the younger artists to abandon formalism and to take inspiration directly from nature and everyday life. Natural scenes became the subjects of their paintings rather than mere backdrops to dramatic events. The leaders of the Barbizon school were Jean-Baptiste Camille Corot, Théodore Rousseau, Jean-François Millet and Charles-François Daubigny; other members included Jules Dupré, Narcisse Virgilio Diaz,Penne Charles Olivier de,Henri Harpignies, Albert Charpin, Félix Ziem, François Louis Français and Alexandre DeFaux. Both Rousseau (1867) and Millet (1875) died at Barbizon. Albert Charpin born in Grasse, France, in 1842, was pupil of Daubigny, a painter of natural landscapes with shepherds girls and her dog taking care of cows and sheep. He is well known member of the Barbizon School and his paintings are found in Museums and private collections in Europe and the Americas. 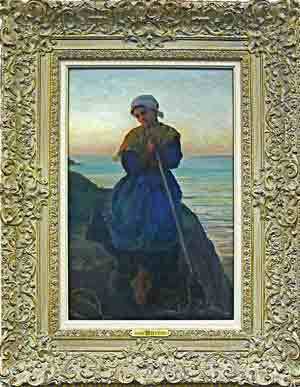 The American Barbizon School was a group of painters whose style was partly influenced by the French Barbizon School. 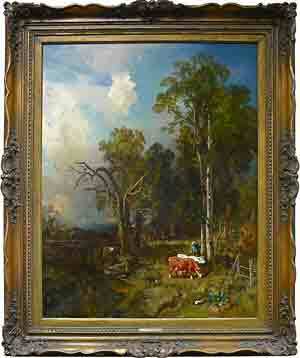 American Barbizon artists concentrated on painting rural landscapes often including peasants or farm animals. W. M. Hunt was the first American to work in the Barbizon style as he directly trained with Jean-François Millet in 1851-1853. When he left France, Hunt established a studio in Boston and worked in the Barbizon manner, bringing the style to the United States of America. The Barbizon approach was generally not accepted in the U.S. until the 1880s reaching its pinnacle of popularity in the 1890s.